Raytheon Streamlines and Automates Its Material Requirement Planning Processes with Exostar's Supply Chain Platform - E2open | Demand. Supply. Delivered. 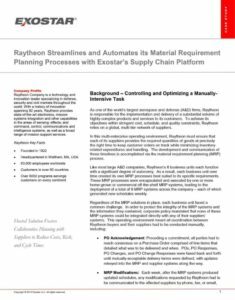 Learn about how Raytheon shifted away from siloed, manual processes to improve its material requirement planning (MRP) approach using Exostar’s Supply Chain Platform powered by E2open software.